Posted by Jon in News, The Others on Friday 21/07/2017 14:18 UTC. Why not consider adding a duck or two to your flock? With the idea of backyard chickens flying off, many people forget how fantastic ducks can be too. With stronger immune systems, ducks are a lot hardier then chickens and make fantastic pets to those new on the scene. Ducks are easy to contain as they don't fly away and have the most comedic personas ever! At brinsley, we have many ducks looking for new homes, why not consider one today? Description: Two male Muscovy ducks. The darker is more confident then the lighter. Very comical breed making strange noises and head movements as they waddle. Pretty to look at too with their black feathers that turn green in the light. On the large side of the scale. Age is unknown and were unwanted pets. 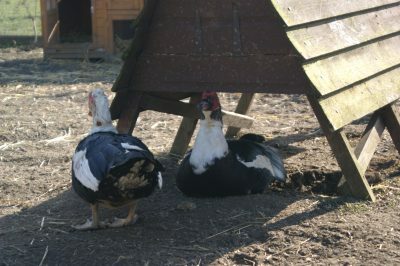 Type Of home Wanted: Ideally would like a home together, these two are used to other breeds of duck as well as chickens. They need a house to sleep in at night that is fox proof ( Shed/ coop) , an area to roam around ( can free roam) and a body of water such as a pool. 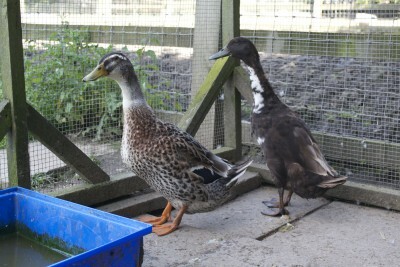 Adoption Fee: We ask for a minimal donation of £10 for both ducks, this helps the charity cover the costs of keep. About Us: A mischievous , lively and cheeky bunch that arrived altogether unwanted. They don't tend to quack as much as the other ducks! These are a great beginners breed, pretty hardy and very entertaining. The females do lay eggs but not as many as the norm. But please do consider a few males as well! Type Of Home Wanted: Ideally want to rehome together as a group but would be willing to split them into a male and female pair. They need a secure house ( fox proof) to sleep in at night and nest. An area to swim in such as a pond or a bath and space to exercise. These ducks are used to sharing with chickens, however please make sure there are enough female ducks in your flock otherwise the males pick on the one female. 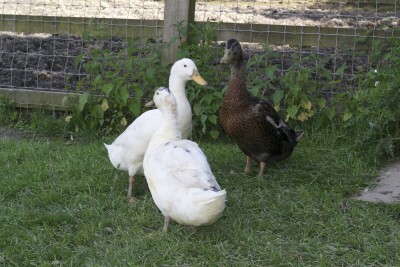 Adoption Fee: We ask for a minimal donation of £15 for the trio or £5 a duck. This aids in the cost of keep for the charity. Description:Indian running ducks all aged around 5 years. 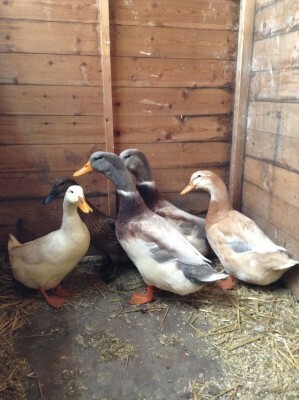 About Us: We are a lively bunch of ducks all from separate cases and different backgrounds. We don't waddle - we run! These ducks love to play in the water and can be quite vocal. Did you know that our breed nickname is the penguin duck? Due to our upright look! We are a hardy breed and would be suitable for a beginner. Type Of Home Wanted: We would like to rehome them together or in ones or twos to existing flocks. Since these guys can't fly the enclosure doesn't need to be high around 2ft at minimum but 4ft is recommend to keep predators out. Netting is need on the fence to keep the ducks in and the foxes out. Due to their active nature, they need a large area. On average four ducks need a space of 25 metres squared, but the amount of space depends on how many ducks and on the type of soil you land is on to help drain. Ducks need a small pool of water to bathe in as well, a tub that can be changed is better then a built in pond. Lastly, they need a comfortable fox proof shed to rest in at night. Adoption Fee: We ask for a minimal donation of £5 a duck to help with the costs of keep. Adopting an animal from us is as easy as 1..2..3! Please contact us to arrange an appointment time, as we are NOT open to the public. View more posts in News, The Others or browse all posts.You can follow this story via its RSS 2.0 feed.